The Duster is the cheapest family SUV on the market. Dacia's Duster is the cheapest family SUV around and there is a lot to recommend it. However, its safety rating raises some concerns for our Motoring Editor, Donal Byrne. I would'nt be the first person to emerge after a drive in the Dacia Duster wondering how something this cheap could be this good, in relative terms at least. 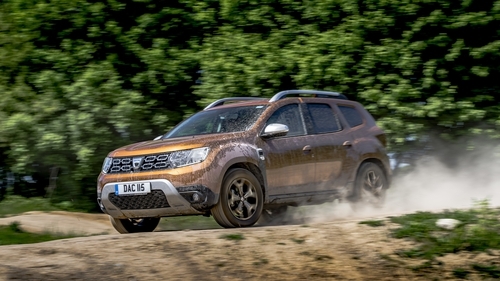 With an entry level price of €17,390 the Duster costs about the same as some second-hand family cars in the same segment and even the Prestige version I drove (with an impressive list of standard equipment) comes in at €21,290. In terms of price and equipment it's quite a package. But there has to be a catch, right ? And there is. Dacia thrives on a low-budget, no-frills marketing strategy, so something,has to give and in the case of the Duster it's a poor enough performance in the EuroNCAP crash test. It's last test results give it an adult occupant protection rating of 71 per cent. a child protection rating of 66 per cent, a pedestrian protection rating of 56 per cent and a safety equipment rating of just 37 per cent on the basis that it does not have equipment such as lane-assist - a feature that stops you wandering into another lane - but which is not standard on all cars either. Nevertheless, it's not good news when you look at other cars in the same class that have five star ratings, while the Duster has an overall 3.5. The car itself is now in its second iteration. All new panels have been fitted and there is an overall fresher look to the car. It's now more subtle and less slabby than it was before. It's even quite smart. Plastic is still a dominant feature inside. The interior is still a sea of plastic, with switchgear that can still be identified from older Renault models. Overall, it's not a plush finish but is quite adequate. Again, you have to remember the price of the car and then measure your expectations. You're not going to get the same finish as you get in a Ford but again, in the context of price, it compares reasonably well with some Japanese cars. Seats have been improved, as was necessary. The older ones were soft and quite unsupportive. Now they are firmer but a long journey will leave you with some minor complaints about overall comfort and strength. Driver and front passenger space are good but rear seating is quite cramped and limited in terms of legroom for taller passengers. The touchscreen infotainment system on the Prestige version is fairly unsophisticated and basic but quite functional, even if the display is somewhat dated and limited. The boot is good, with a 445 litre capacity, although four wheel drive versions lose out both in terms of the boot and the interior space. The engine is a 1.5 diesel with 115 horse power, a unit that has been around for a long time. However, as a diesel it is flexible with good low-range torque and while it's quieter than I remember the older car's being, it is still a bit thrashy and noisy. It is good on fuel at about 5.6 litres per 100 kilometres on a long journey and a bit higher again in the city, but its overall efficiency is impressive. Ride and handling are good but it's not a car to smooth out the bumps and hollows as smoothly as one would want and certainly a car like the Ford Focus or the newer Qashqai does a better job. However, there is no real major cause for complaint. The Duster has electric power steering now and it makes a difference to overall comfort and ease of driving. Equipment levels on the entry level car are very good with 16" steel wheels, LED day time running lights, front fog lights, ECO driving mode, hill start assist, 4 speaker DAB/FM/AM tuner with steering-column mounted fingertip controls, Bluetooth connectivity, manual air conditioning and black roof bars. The Prestige version also gets alloy wheels, cruise control, keyless entry, partial leather, climate control and a multi-view camera, among other items. It's a good overall package for the prices. Something else worthy of note about the Dacia is its ranking in the recent What Car ? reliability survey. It came in at 13th place among 31 manufacturers, actually ahead of Renault, its parent company. And the Duster finished 10th out of 14 family SUV's - ahead of the Mercedes GLA and the Range Rover Evoque ! If that safety rating was better, I'd be almost completely convinced by the Duster as a very impressive and economical proposition. Reviewed: Europe's top-selling plug-in hybrid SUV, the Mitsubishi Outlander.